In assembly lines for multi-variant products, the order sequence ultimately determines whether the production runs seamlessly or not and whether the planned number of pieces produced is reached or not. Unfavorable sequences lead to peaks in the workload, which are very expensive to be offset by floater operations or even conveyer’s stops. 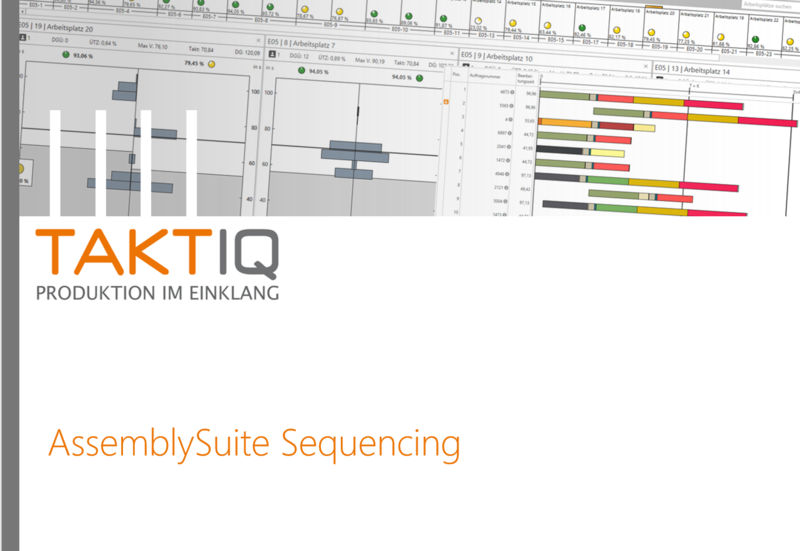 Our sequencing module calculates optimal order sequences within only a few seconds. An intuitive interface and highly efficient algorithms ensure that manual sequencing finally becomes a thing of the past. However, any simple order can always be moved manually via drag-and-drop. 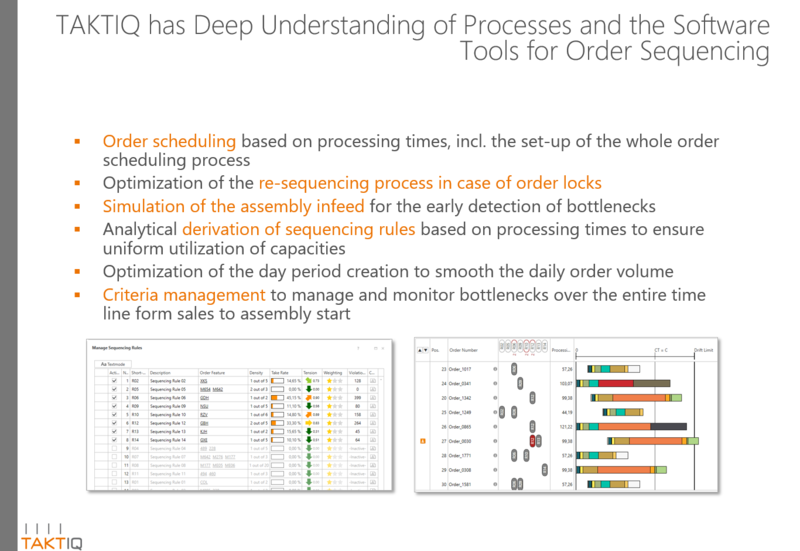 Time and costs for the planning of order sequences will be cut by generating faultless sequences within only seconds. You choose the appropriate sequencing method for your production: Our sequencing module supports rule-based processes as well as processes based on production time. “RHD max. 1 out of 2”. Thanks to our software, rule-based sequencing is robust, easily accessible and quick. All density criteria ensure that the sequence consists of a solid and reliable structure. All those being involved in the production will therefore be prepared for the particular sequencing of their orders. In addition, the limits for short-term re-sequencing are clearly set. Our module and the sequencer provides the best sequences in a very short time because our algorithms can rate more than 1.000000 sequences per second. Additional options, such as a uniform distribution or the application of rules on a subset of orders, are supported. This is a very efficient method, which will deliver near-optimal results by using the appropriate rules. We use all available information to provide you with the best sequence for any order quantity. Thanks to a detailed task list and a variant overview, the processing times for all orders are known at every single station. The method workload sequencing uses all data to calculate the optimal sequence for a levelled utilization of all workplaces for an entire line. That’s how bottlenecks are best avoided and the sequencing of orders can be used independently from any predefined rules. 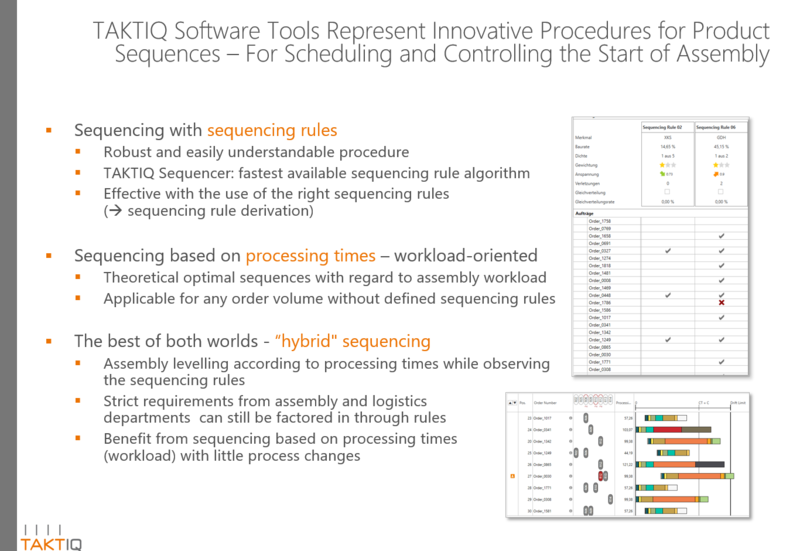 Our hybrid sequencing approach combines the advantages of sequencing rules and the qualities of workload sequencing. Within the scope of given sequencing rules, the software will calculate the best smoothed sequence that will reduce the number of bottlenecks many times over. Strict guidelines for the assembly and the logistic can still be formulated in form of comprehensible and reliable rules. A valuation of the processing times ensures an optimally levelled sequence within the framework of the sequencing rules. New perspectives arise due to the integration of sequencing in the module line balancing. Analyze and optimize realistic production sequences for all stations. Considering the sequencing rules, the software is able to generate particular best and worst case sequences for every station. The module can seamlessly be integrated into existing IT systems and manages order planning from the creation of daily sequences to the montly sequencing (planning) and the resequencing (control).